When confronting the unknown, it’s always essential to have friends by your side, pals and confidants alike. Last year seemed to hit us with an unyielding amount of garbage news and events. Despite the horrors of 2017 (and there were multitudes of them), we made it out! Facing a brand new year is both ridiculously freeing and intimidating. When confronting the unknown, it’s always essential to have friends by your side, pals and confidants alike. That’s why I’ve decided to compile some of my favorite episodes of The Golden Girls — everyone’s favorite, senior-friendship-focused TV show. From self-care, to finding resolve in friendship, to shutting down gross men, these ~golden gals~ have a lot to teach us about how to survive 2018. 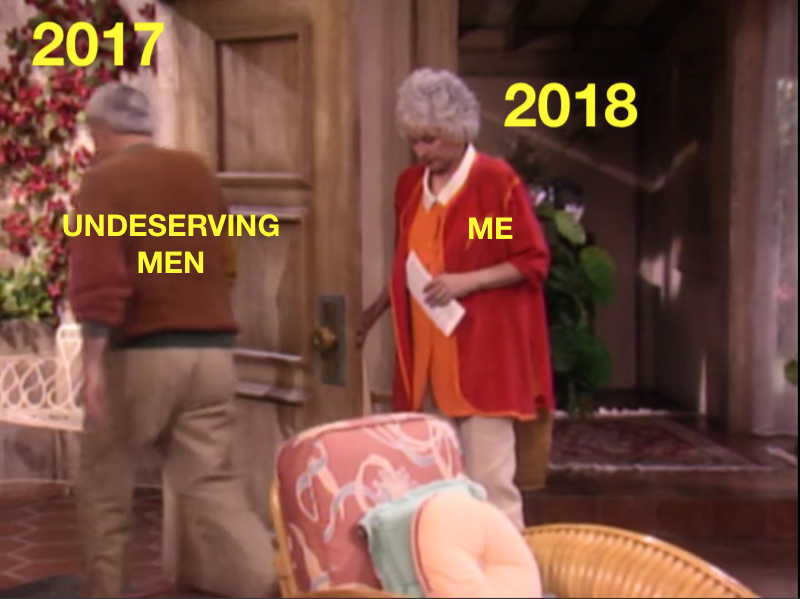 When Blanche discovers she’s going through menopause, she begins to increasingly worry about what this means for her self-worth. Eventually, she becomes so distraught that (with the encouragement of the rest of the girls) she decides to see a therapist. It’s a powerful reminder that no matter what we’re going through, seeking help and taking the time to take care of yourself is normal and necessary! While life can get overwhelming at times, there’s always a way to work through it. This is essential to remember in the upcoming year. Sophia doesn’t get a lot of screen time within the series, making up for it with some of the best and most memorable one-liners in the show. However this episode, centering around a day in the life of everyone’s favorite Sicilian, is a nice change of pace. It’s also a great reminder (and example) of how important it is to cultivate a rich personal life. Whether it’s volunteering at your local hospital, taking a trip to the grocery store, or organizing a small band of old ladies who are also kickass musicians, 2018 should be a year of fulfillment. We’ve all been there — that one crush we can’t seem to let go of. Dorothy finds herself in a similar position when an old high school teacher contacts her about catching up. Even though it’s been years, Dorothy is clearly still infatuated with the titular Mr. Gordon. She is blinded by it, and he uses her to work on a newspaper article. However, Sophia Petrillo didn’t raise a fool, and as soon as she realizes Mr. Gordon’s game, Dorothy confronts him. Just like that, he’s out of here. This is a shining example of the toxic relationships/people that we are leaving back in 2017 — who has time for soul-sucking men anyway? Working through relationships and navigating the dating scene is something that we’ve all dealt with at some point in our lives. Because Rose hasn’t been with anyone since her late husband, she’s worried about when she should sleep with Arnie, her latest boyfriend. Ultimately, this episode teaches a pretty important lesson about love (and hell, life too) — go at your own pace. There’s no set timeline or benchmarks for what happens in any relationship, so, this coming year, do what feels right for you, and everything will fall into place. While working together on a play, the girls all happen to fall for the same actor. On opening night, the scumbag confesses to having dated pretty much everyone in the cast and crew, and the girls do not let him off easily. They drag him for filth in front of a live audience (and get uproarious applause!! ); and honestly, that’s the kind of zero tolerance for male nonsense I’m trying to emulate in 2018. We may not know what this year has in store for us, but we can take these lessons with us as we work through it all. May Blanche, Sophia, Dorothy, and Rose grant us the strength and inspiration to survive this year, no matter what it throws at us. Alejandra is a Tejana writer, reader, film lover, pun enthusiast, & MSIS student. When she's not thinking about the greater implications of the latest season of Twin Peaks or watching makeup tutorials on YouTube, you can find her hanging out at your local coffee shop.